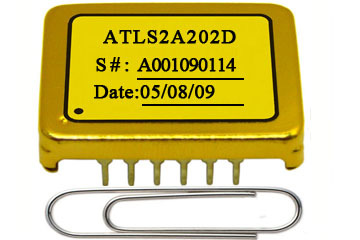 The ATLSxA202D series of laser drivers have slightly different pin out as that of the ATLSxA201D series of laser drivers. This series of laser drivers has a synchronization function pin which allows using an external digital signal to synchronize the internal switching frequency of the PWM output stage. This function is useful when using the laser drivers with a switching power supply that has similar switching frequency or while using multiple such laser drivers on the same PCB, to eliminate the beating frequency interference. They are designed for driving laser diodes with low noise constant current with very high efficiency. The "xA" in the part number specifies the maximum output current of the laser controller and you may choose from the following output currents: 500mA, 1A, 2A, 3A, 4A or 6A. The module is packaged in a metal enclosure, emitting zero EMIs, and has our DIP mounting package. These laser drivers are of 100 % lead (Pb)-free and RoHS compliant. It comes with a high stability low noise 2.5V voltage reference output which can be used for setting the output current. The reference output can also be used for the ADCs (Analog to Digital Converters) and/or DACs (Digital to Analog Converters) to monitor the laser output current and/or set the laser output current respectively. The frequency synchronization of this laser driver allows using an external digital signal to synchronize the internal PWM output stage of the laser driver, which eliminates frequency beating interferences between the laser drivers and other switch-mode electronic circuits on the same PCB.